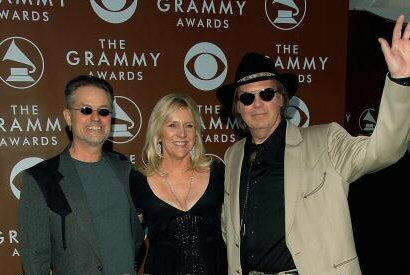 Neil Young News: Neil Young and Emmylou Harris: Guess who has 11 Grammy Awards and which one has zero? 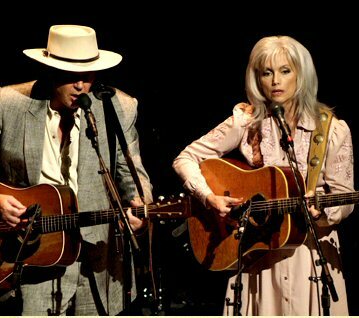 Neil Young and Emmylou Harris: Guess who has 11 Grammy Awards and which one has zero? UPDATE - Feb. 12: Neil's perfect Grammy streak continues -- zero awards. Well, at least he lost to Dylan in the Best Solo Rock Vocal Performance category. This weekend, the annual Grammy Awards will be handed out. Neil Young received 3 Grammy Awards nominations for "Living With War". Nominated for Best Rock Album, and 'Lookin' For A Leader' was nominated for Best Rock Song and Best Solo Rock Vocal Performance." So, guess who has 11 Grammy Awards and who has zero? Emmylou Harris has received at least 11 Grammy Awards in her career. Neil Young -- 0, zero, nada. Not that it matters. Neil Young was up for 2 grammy nominations for Prairie Wind last year. He even dressed up and attended the ceremonies. Will he attend this year? Good for Emmylou. And I'm sure that Neil probably doesn't cared that he's been dissed by the Grammys. Neil never care about any kind of Fuxxxxx Musuc Awards, those awards meant nothing to him. I agree. The Grammys are useless. Britney Spears has a Grammy. 'Nuff said. Neil should start his own award "The Shakeys". I'm curious as to how many she's won for her solo work as opposed to working with others (singing with Gram or Bob, for instance). Anyone know? The Grammys will never hand the award - and microphone - over to a guy who sang Let's Impeach The President. It's just too risky. And the Grammys definitely aren't about rewarding risk takers. The Greatest Moment in the History of the Shammys is Milli Vanilli. God Bless fantastic treasures like Emmylou who are richly deserving of recognition but we all know that Neil don't need no stinkin Shammy. I like to advise Neil not to attend and do any live performance in such commercial show to entertain the people and the viewers of TV. Dang, neil get a Grammy ? " and smog might turn to stars , Someday"
If Neil couldn't win a Grammy last year for the middle of the road Prairie Wind, there's no way he'll win anything this year. But maybe I'll be wrong? "If Grammy voters are feeling particularly political, they could also honor Neil Young for his anti-Bush album 'Living With War,' which yielded three rock nominations. The Canadian singer/songwriter, who has never won a Grammy, recorded his state-of-the-union album in six days last year and quickly uploaded the songs to his Web site. 'No one has come out like him, or like Arlo Guthrie, and written about America and what it means to be an American,' said Tom Araya, vocalist with hard rock band Slayer." Yes, they are averse to risk, but sometimes the clouds do part and the amazing does happen, even in Washington, even in Hollywood, even in corporate America. So hats off to Neil, who just doesn't really care; except that as a human, way, way deep down, I know it would give him one of those sly smiles. For that, I'd be grateful of heaven. Another winless year for Neil, oh well. Neil's Grammy goose egg is a badge of honor! The Grammy Awards may be the most pointless exercise of the year. Can anyone say Milli Vanilli or Starland Vocal Band? As I recall Neil does have a grammy. He received a grammy for This Note's for You. He didn't attend the grammy awards but accepted in a either a taped or remote acsess manner. Neil seemingly has always had a disdain for the Awards aspect of performing as I recall it was rumored he persuaded Carrie from going to the academy awards. The awards aren't a measure in my mind. Just keep listenin' to this treasure. I saw both Neil and Dylan last year in performance. The July performance in Mlps st.paul on that hot hot night... Bravo Bravo you boys get it on. i was the happiest person in the joint and sang along like part of the band. CSNY won that race like a Barbaro finish they came in first place.